It's Tuesday so traditionally it's always been regarded as new music day, so let me introduce you to some new music, from a new/not so new band. 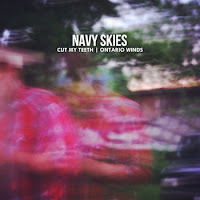 Navy Skies (once known as Rebel Rebel) continue their quest to produce great rock n' roll and also become known as Toronto's hardest working band. Navy Skies is Travis Caine, Kara-Lynn Gauthier, Bryan Wyshnicki, and Paul Cope. Here is their latest single "Cut My Teeth"…great tune.